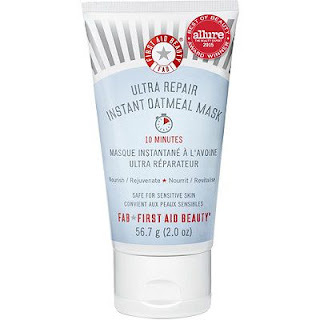 First Aid Beauty Ultra Repair Instant Oatmeal Mask is creamy and dreamy with little bits of actual oatmeal floating around in it. It does a fantastic job of soothing the skin and reducing any redness or inflammation. And I would actually recommend it for anyone who just wants a really moisturizing mask, because it plumps and hydrates deeply. It also has a bunch of restoring anitoxidants in it. I always buy a backup because I never want to be without it in my arsenal. 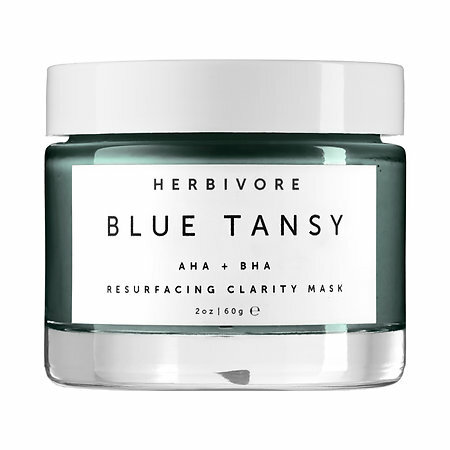 Herbivore Blue Tansy AHA + BHA Resurfacing Clarity Mask is a terrific way for people of any skin type to exfoliate. It is a thin blue gel of fruit enzymes and salicylic acid that dissolves and eats away layers of dead skin cells. Leave it on for 15 to 20 mins, or if you have sensitive skin only 5 mins. It is actually the best way for sensitive skin to exfoliate because there are no harsh scrub granules to tear and irritate the skin. 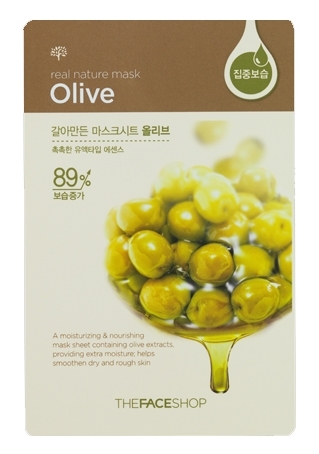 This 100% natural mask will give you the smoothest skin and totally unclog your blackheads as well. 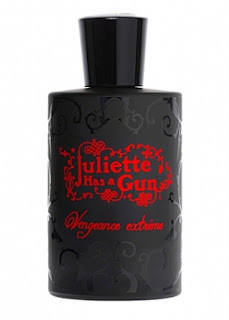 I am very curious to try more from this brand! Boscia Tsubaki Oil Deep Hydration Hydrogel Mask gives phenomenal results. I initially bought only one but after using it ran out to get some more. I can't remember the last time my skin was so plump and firm and glowing. 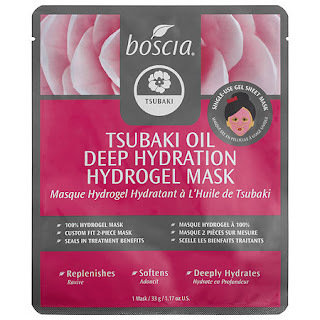 I think the Tsubaki oil is the key - I love that stuff. And it is a little unusual for a sheet mask because it comes in two sheets/two halves; a top of the face and a bottom of the face for better, more accurate coverage. At $8.00 it's a tad bit pricey for a sheet mask but it's luxury all the way, and if you have a special event you need to prep for this is the what you'll want. 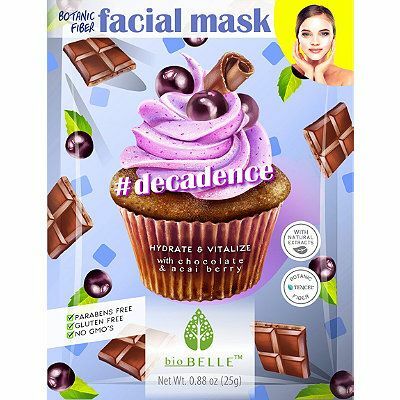 Biobelle #Decadence Sheet Mask is a fairly inexpensive sheet mask that is worth every penny and more. It has chocolate and acai berries as antioxidants in it, but if you are looking for something natural this is not the mask for you. That said, with one use it will turn back time to a much younger-looking you. This mask leaves the skin a bit sticky but for me the youthifying benefits out weigh that. Also the results last for ages. And who can resist the packaging! If you are looking for inexpensive sheet masks go shopping at The Face Shop. It is a South Korean chain of international stores that carries Asian skincare. If there is a store near you you should definitely go because they do not ship to the USA yet (that is coming soon). Or for fun and adventure and more cheap prices search out shops in your local city's Chinatown/Japan town - because we all know that Asian skincare is some of the best in the world. At these places you can get effective masks for only $2 or $3 and right now The Face Shop is having a sheet mask sale buy 10 get 5 free. I just did a hydrating olive one that was luscious.